Mental health organization dedicated to the prevention, treatment, and cure of anxiety, depression and co-occurring disorders through education, practice, and research. ADAA provides free education and helps people find treatment, resources, and support. Yesterday I celebrated my 55th birthday at a performance of Wicked with my wife and children. The lonely, terrifying memories of my first panic attack 34 years ago and my year of agoraphobia trapped in my apartment have faded. I can scarcely believe it. I'm fully recovered, and my life is full, happy, and satisfying. Thank you for all you do. Please let others know that they will recover, too. I am 17, and I suffer from anxiety and depression. Last summer I almost committed suicide, but I got help, and spoke out about my disorder at my school. Thank you, ADAA, for giving and teaching so much. Please continue your efforts as wonderfully as you always have. I'm 72 years old now and remember having panic attacks since I was about 12! It's wonderful beyond words to be free of all that and that I have the tools to deal with it. I never thought that I could be calm and at ease with the world. My daughter suffers from anxiety, and we just dropped her off at college. She has been under treatment for some time, but it has changed her life around, and she is doing great! Thank you for all the work you do! I have lived with GAD for over 40 years. It is a lonely and tiring road sometimes. Thank you for helping me not be ashamed of who I am. Triumph Over Anxiety and Depression! 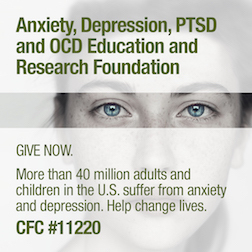 ADAA offers a broad range of educational resources to help end the suffering. Knowledge IS power and we invite you to join us to #breakthestigma. Please follow us on social media and help raise awareness!